This page covers various means of rotating a workpiece by a fixed amount and then machining it at a particular point. Often this might be done more than once on any one workpiece. This is known as indexing. This does not cover machining between one point and another. This is usually done using either a rotary table or a dividing head. These are covered on other pages. 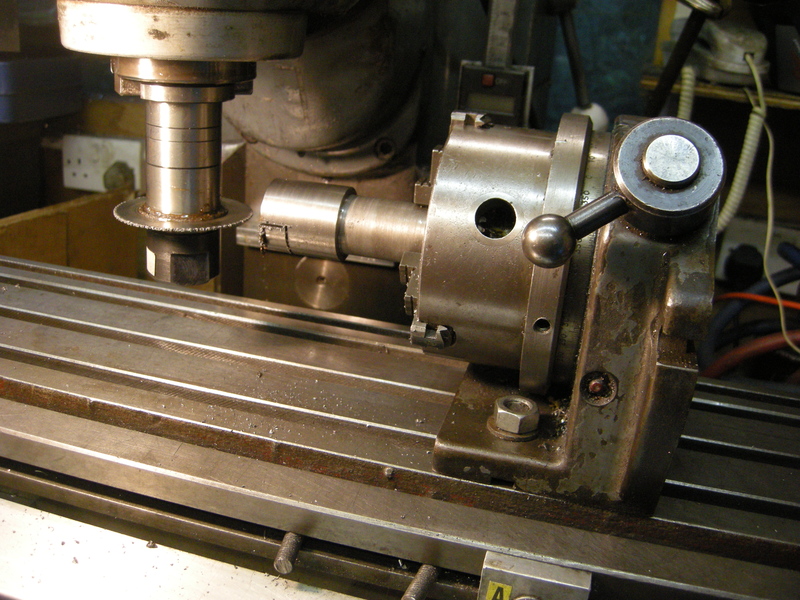 Very often a circular workpiece needs to be machined, which can include drilling. If the diameter of the workpiece is small, say, less than 25mm, then it can be held in some sort of indexing device that holds collets. A collet block is simply a square or hexagonal shape that is designed to hold a certain type of collet. It turns a round shape into a square or hexagonal one that can then be held in a vice. If the part needs, for example, to be drilled at points on a circle divided equally by 2, 3, 4, 6 then the part can be held in a collet block. This can be held in a vice using a stop. 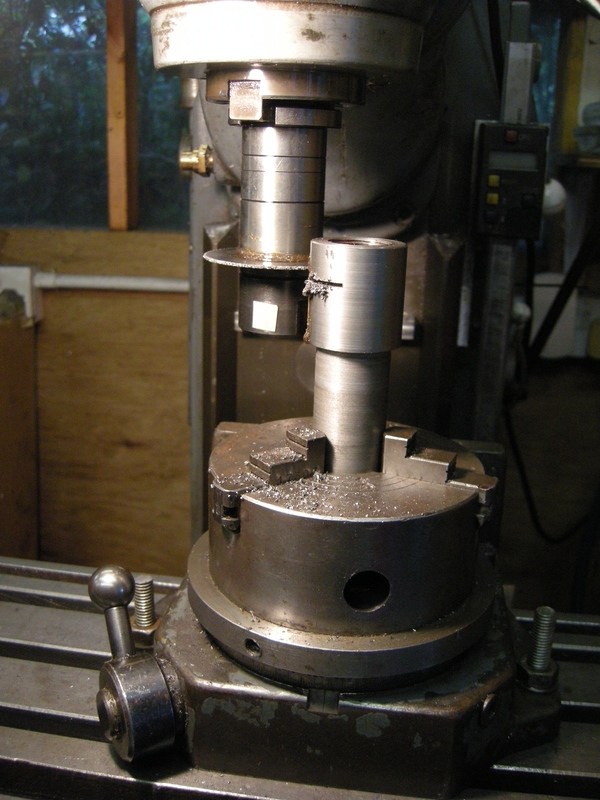 After each drilling operation the collet can be rotated and the next hole drilled. The vice stop is essential so that the workpiece is in the same position but rotated after each operation. Very often cuts or holes are equally spaced with the same angle between them. One example of this would be a cylinder cover. In this case an indexing device is very useful. 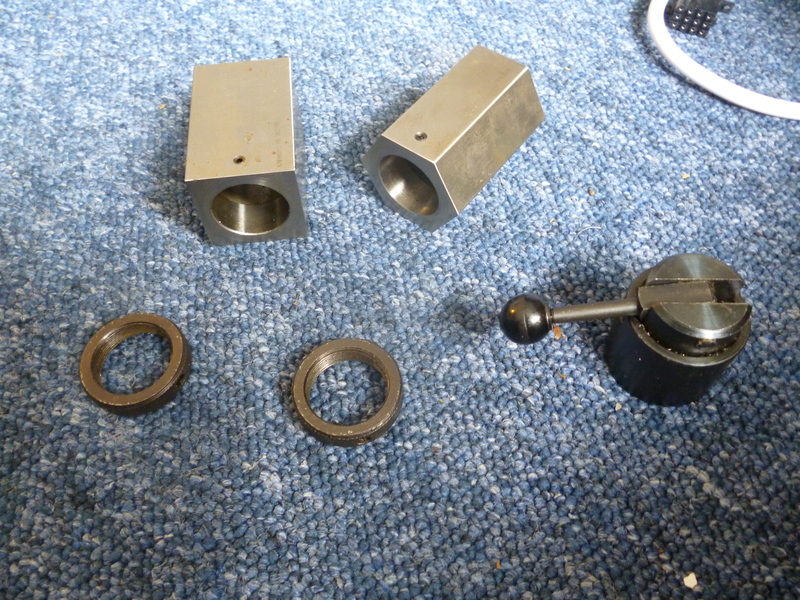 These are usually designed to hold round workpieces and are able to rotate them. They are designed to automatically lock into position at any one of, for example, 24, fixed, equally spaced positions. If any of the holes needed do coincide with all or any of these 24 positions then this is usually the quickest way of doing the job. For round parts with small diameters an indexing collet chuck is more convenient as well as allowing division by larger numbers. For larger diameters of workpiece, it is possible to use an indexing three jaw chuck. In the case of drilling it is often easier to do this on a drilling machine rather than on a milling machine. Either way the holes should be center drilled first and then drilled completely. 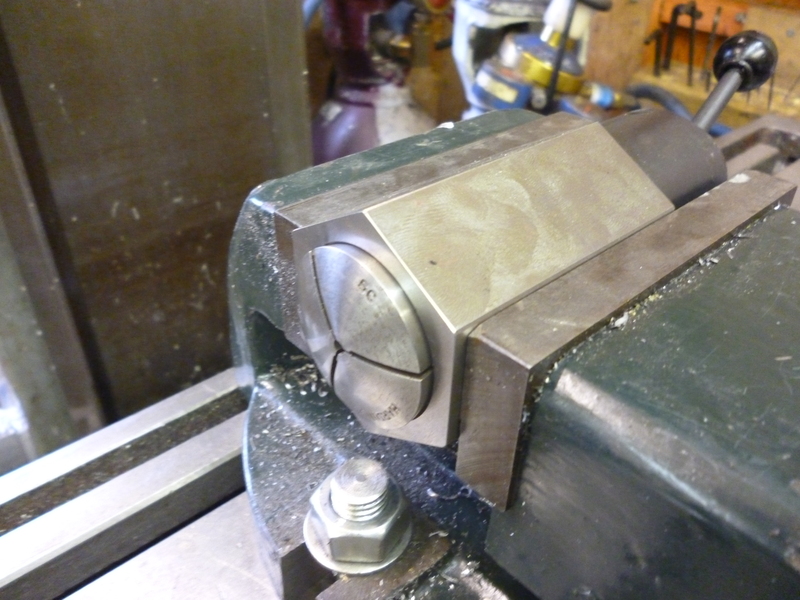 A three-jaw chuck can always be used to hold collects by means of a collet block. This was described earlier. In this case the hexagonal block would be used. Indexed four jaw chucks are very rare. The difference is that a three jaw chuck always centers the workpiece with the same accuracy. 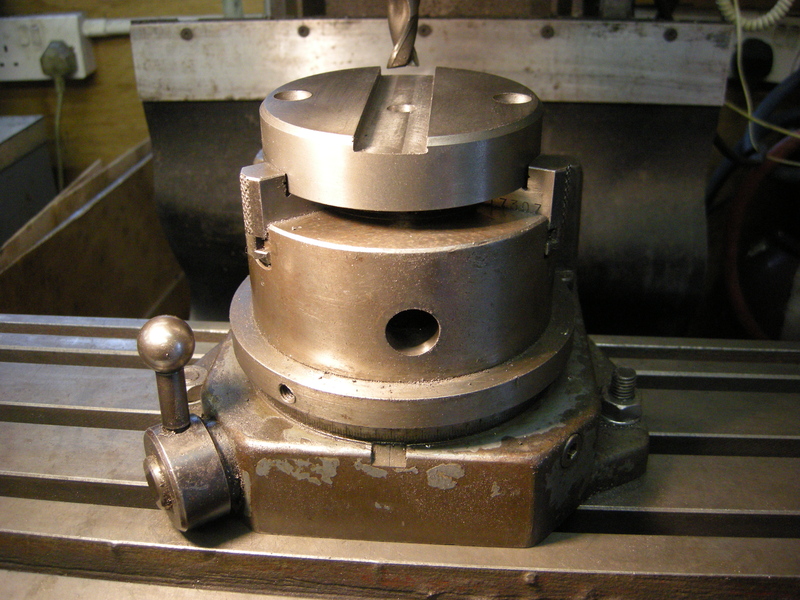 A four jaw chuck has to be setup carefully for each workpiece. If a large number need to be made it is better to make a jig that holds each bit accurately without any careful adjustment. On an indexing device the position of the locking positions is fixed but sometimes there is a mechanism for skipping a combination of locking positions or even individual ones. Usually when using a rotary device most of the movement of the workpiece is done by the rotation of the device – not the milling table. Very often a whole series of cuts might be made whilst using the indexing device. During this the milling table will not move. 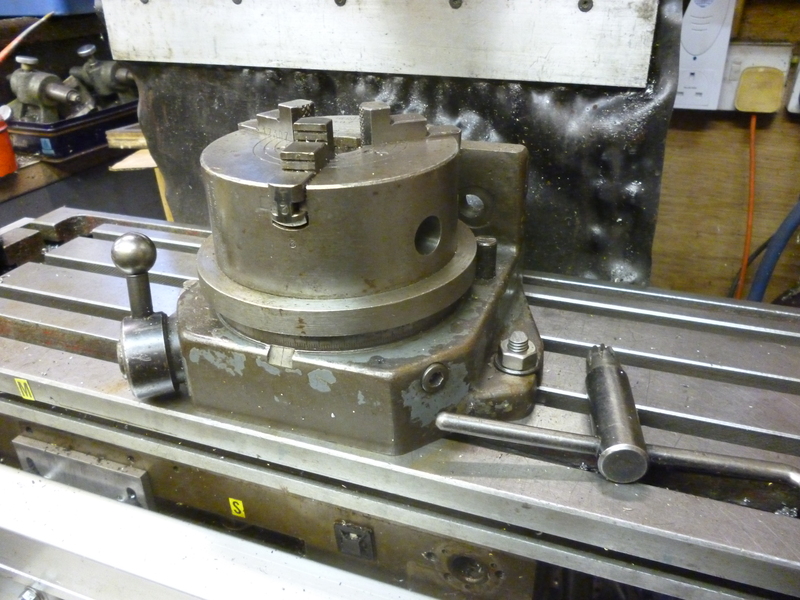 In this sort of case it is essential to lock the movement of the milling table. Usually the locking mechanism that selects a location on an indexing device is solid enough for it to be possible to mill the workpiece without locking the movement as well. If it is necessary to drill, etc at a place where the indexing method does not lock it then it has to be locked some other way. Some indexing devices are graduated round the edge in degrees. Usually it is possible to lock them at any position. This means it is possible to use indexing for most of the holes and then to drill any holes that do not fit the indexing pattern by setting the angle using the calibration, locking the chuck and drilling the hole. This often happens with cylinder covers. This chuck can be fitted in either the vertical or horizontal positions. The advantage of an indexing mechanism is that it is much faster than using a worm drive and, just as useful, considering how many times it is necessary to divide a circle into a small number of fixed angles; it is far less likely to let the user make a mistake. There are usually situations where a collet chuck needs to be centered – whether it is horizontal or when it is vertical. Centering is where the axis of the collet chuck and the axis of the spindle are made to be in the same plane. In this case the axes are at right angles. The best method is with a spigot in the spindle and another spigot of the same diameter in the collet. 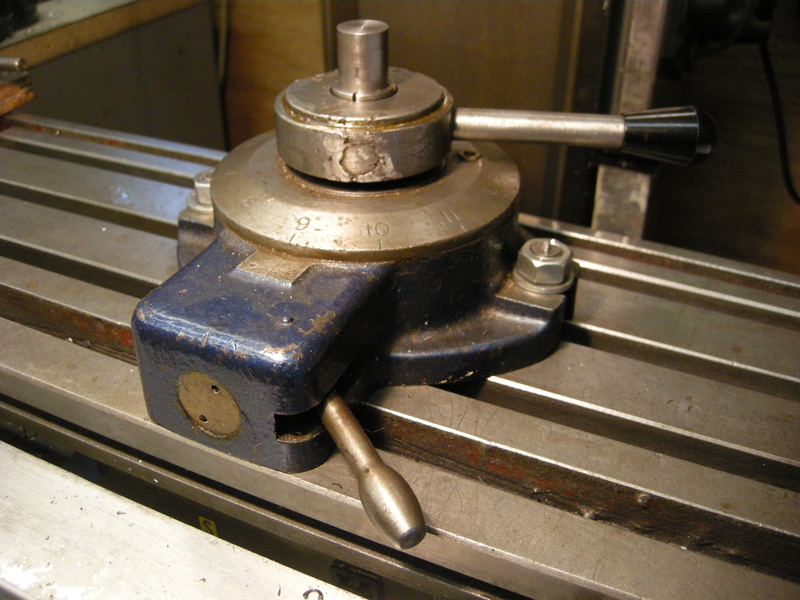 In this example the collet chuck is an Autolock type. The spigot needs a screw thread to fit the chuck. This was made from a long series endmill just by grinding off the cutting parts. The simplest and usually the best way of aligning a collet chuck is by means of the single spigot method. One spigot fits the milling chuck. 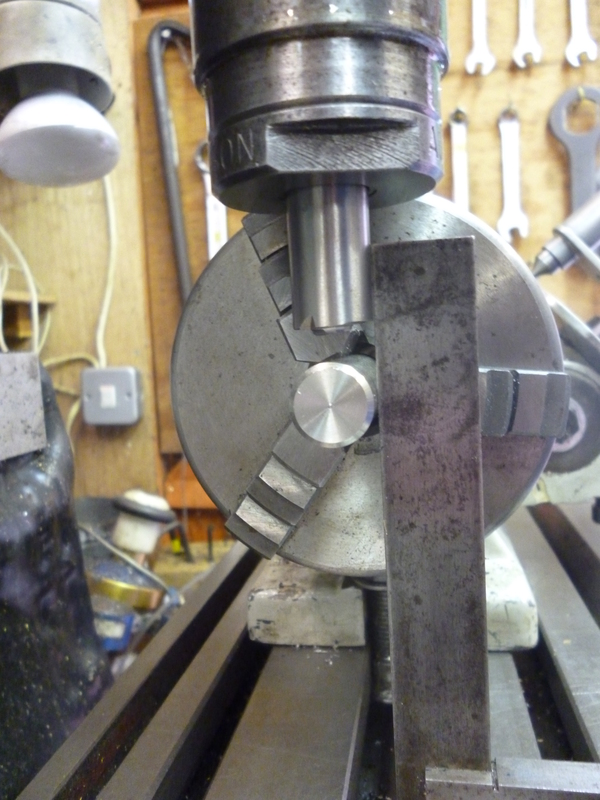 A spigot of the same size is fitted to the indexing collet chuck. The indexing device is not fixed to the milling table. It is moved till its spigot fits in a bush that is fitted to the spigot in the milling chuck. 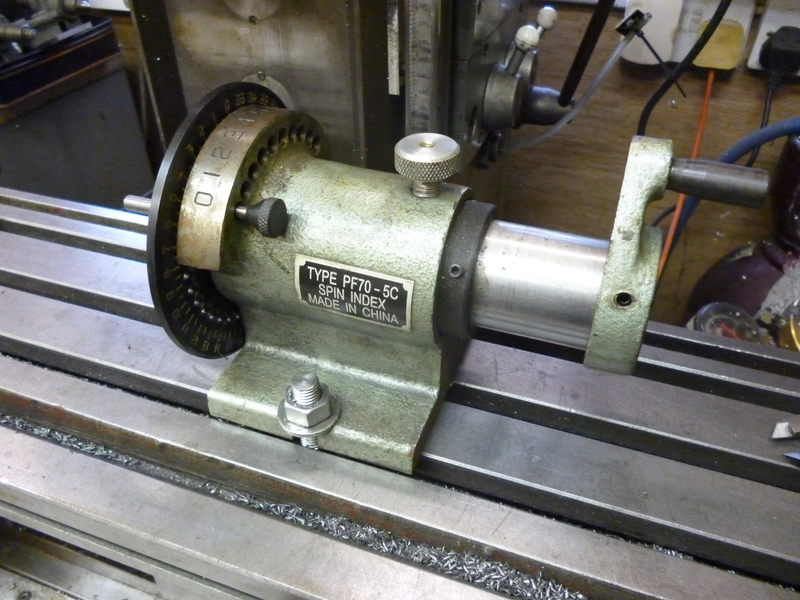 Then move the milling table so the indexing device can be bolted to it. The neat thing about this is that the spigot does not have to be the same size as the workpiece – just change the collet. An indexing chuck is useful for holding a round workpiece even if it does not need to be rotated. A common component that can be made using this is a collar that is slit. One part of the collar fits on a shaft. A small part of its length is slit so it can be tightened around the shaft. This means the shaft, with a hole in it. Is cut half way through one way and then slit the other way as well. It is very convenient, with the workpiece in this position, to mill a flat for the clamping screw, a tapping size hole in which to make a thread for the screw and then a clearance hole for the shank of the screw in the top side of the collar.